Enjoy an early evening fish and chip supper on board a steam train during two round trips of the Great Central Railway on our Fish & Chip Trains. 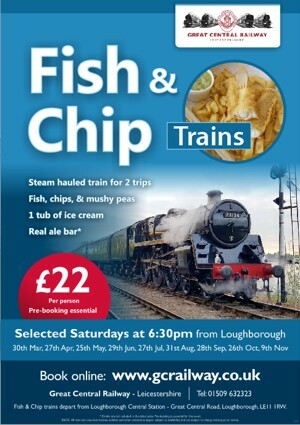 Fish & Chip trains departs from Loughborough Central at 6.30pm on selected Saturdays. Tickets are only £22* per person and your supper of fish, chips, and mushy peas + 1 tub of ice-cream is included. Don’t forget, it’s two round trips....and £18 is our normal runabout fare. Due to limited seats on this train, tickets are available for advance internet booking only. Please choose your date carefully when in the ticket system. There are no concessionary fares. The train departs Loughborough Central at 18.30 and makes two trips to Leicester North, before returning to Loughborough Central at approx. 21.45. A selection of real ale, other alcoholic beverages and soft drinks are available to purchase on board during your journey. Less able-bodied passengers, due to the configuration of the coaches, can only be accommodated if they are not confined to a wheelchair. Due to how our fish and chips are cooked, unfortunately we are unable to provide a gluten-free alternative.